Information Technology is a critical driver of strategic transformations as well as organizational performance. Information Technology provides the connection to the customer. The information about the customer, the behaviors, the experience and the product uses are strategic assets and input to strategic decisions that have long reaching implications. 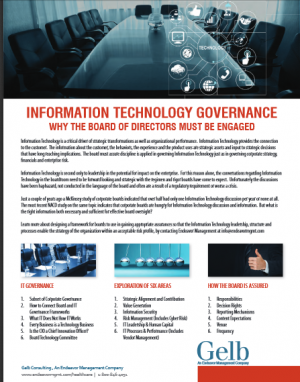 The board must assure discipline is applied in governing Information Technology just as in governing corporate strategy, facials and enterprise risk.